It’s no secret that every brand needs to be on social media these days— whether it’s a fully-active Instagram profile publishing content regularly or something as simple as a Facebook location for people to check-in at. However, we often see brands bite off a little more than they can chew and create accounts and profiles on every platform possible. For some, every platform will offer them something valuable, while other brands may be better suited for one or two platforms. Knowing which platform is best suited for your brand’s needs is the first step to mastering social media marketing and can make all the difference between a good online presence and a bad one. Keep reading for a breakdown of the major social platforms and what they offer. And regardless of which platform(s) you choose, remember to always proceed with a plan. Whether you’re a local business or a national corporation, these are the platforms we can guarantee almost all brands have at least one of. They offer the largest potential audience and have established themselves as the giants of social media. Let’s start with quite possibly the most popular social network right now, Instagram. Instagram is a photo and video sharing social network where brands can create a profile and share photos and videos related to their business and industry. This platform has a heavy focus on hashtags and uses them to sort content and distribute similar content to users. As a brand, this can expand your reach and increase your number of followers. Only recently has Instagram started to offer brands a unique experience through their business profiles. These profiles provide brands space to display their contact info and address on their profile and also provide you with some insights. Facebook is one of the older social media platforms around, but contrary to what some people believe, it does not seem to be slowing down. With new features released almost monthly, Facebook offers brands a second home on the web. Brands can share photos, videos and links as well as showcase services, operating hours, pricing, and much more. And thanks to Facebook’s Messenger, customers have yet another way to contact brands. At one point, Twitter was one of the most popular social media platforms. And although it seems to be losing traction slowly, Twitter is still very much a viable network for some brands. With a character limit of 280 characters (up from 140 in past years), Twitter offers brands a unique option for interacting with consumers— brands can share links, photos and videos. Twitter is unique in the sense that your news feed is always refreshing, making it a perfect solution for brands looking to join conversations about live events and time-sensitive topics. Believe it or not, YouTube is classified as a social network. But unlike any other social media network, YouTube is solely focused on video. This offers brands a place to share product launches, recipes, reviews, troubleshooting help, Q and A sessions and more. And with a monthly user base of 1.8 billion YouTubers, it is incredibly crucial that brands share nothing less than high-quality content. YouTube is quickly becoming the “TV” of the 21st century. Snapchat continues to be one of the most popular social networks of the present day. Snapchat is a time-limited photo and video sharing platform that allows users to send and receive content that can only be viewed for set lengths of time. After that, they’re gone. And while this platform is one that many brands have yet to harness, it offers many opportunities for brands to create a unique brand experience. Brands can share links and other useful info thanks to Snapchat’s story feature and can even purchase filters and frames for special events and launches. If your brand focuses on DIY projects, fashion, food or any form of design, we strongly recommend you consider Pinterest as a social media network for your brand. Pinterest lets users “pin” content that they find interesting to “boards” which can then be followed by other users. In recent years, Pinterest has become the go-to source for DIY ideas, fashion trends, unique recipes and all forms of design inspiration. LinkedIn is B2B central in the world of social media. Whether you’re a brand or a professional, LinkedIn offers you a unique way to share team-focused photos, videos and links with colleagues. We like to think of it as a business-focused Facebook with a focus on ROI rather than memes. Now that you have a good idea of what platform(s) suit your brand the best, you’re almost ready to start crafting your social media presence. But no matter what platform(s) you choose to proceed with, it’s important to remember a few things. Always have a plan – This means planning your tone, style and content ahead of time to ensure your social media presence reflects that of your brand. Specific content doesn’t necessarily need to be scheduled ahead of time (though it helps save time), but knowing what content and topics you want to share and when can save you from some serious stress. 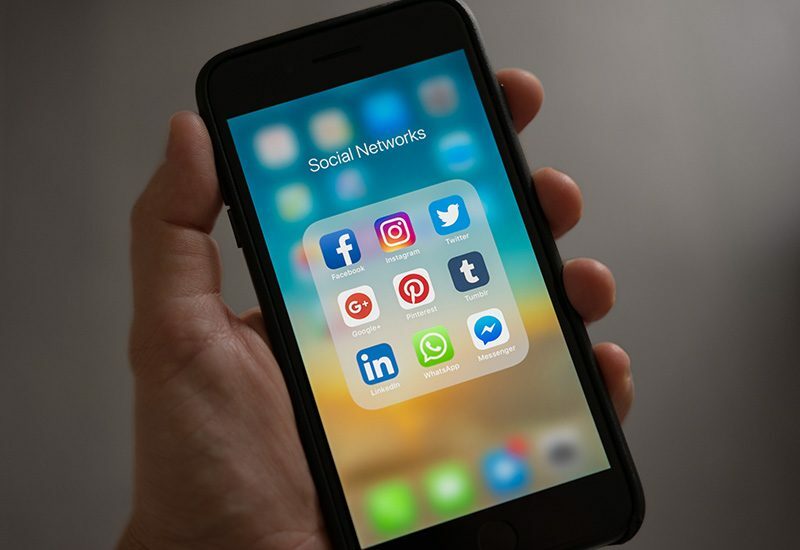 Start Small – It might be tempting to launch a Facebook, Instagram and Pinterest account all at once, but we suggest starting with one if you’re new to social media. This way you can focus on mastering one platform rather than struggling to learn three platforms at the same time. You can always create the profiles on the remaining platforms at a later date. Consider a Social Media Scheduler – Nowadays, there are many different social media schedulers available. Some can be quite expensive while others may be free. Schedulers offer brands a comprehensive tool for scheduling and publishing content automatically to your various profiles. This means you can spend a few hours at the beginning of the month to create and schedule your content and then simply worry about managing engagement for the remainder of the month. Note: some schedulers can publish automatically to Instagram business profiles while others can’t, so be sure to do your research before investing in one. Ask for Help When Needed – Just like how you’re an expert on your brand’s industry, we’re experts at all things digital and social. We don’t expect you to be a social media superstar right off the bat, but to make your social media presence profitable, you’ll need to get there eventually. For many brands, they choose to work with a digital marketing agency like ourselves to ensure their social media presence is nothing short of spectacular. In most cases, our team handles everything from content creation and scheduling to community management and reporting. While in other cases, we merely handle content creation and scheduling and leave community management up to our client. Whatever type of social media sidekick you’re looking for, we can help. If you have any questions regarding anything discussed above, would like a social media crash course or would even like to schedule an appointment to meet with us to discuss your brand’s social media presence, give us a call or send us an email and we would be more than happy to help.